If you wanted your students to fail, what would you do? If you wanted to trip them on their learning journey what insights does your job give you in terms of what is the critical support, information and services you provide? On Tuesday 24th Jason Bailey (@jason_lta) and I ran a short session at the University of Brighton Information Services Staff Conference, where we asked folk these very questions. The set-up was that we work for the “Evil Learning” team, and were looking for opportunities to disrupt our excellent processes. The reverse psychology employed in techniques like this is really very freeing, people find it quite easy to think of loads of examples of how systems can be disrupted, whereas if you asked for ways to improve a system, the responses tend not to be so enthusiastic. The idea isn’t mine, I nicked it from a session run as part of the Jisc Effective Assessment in the Digital Age Programme. 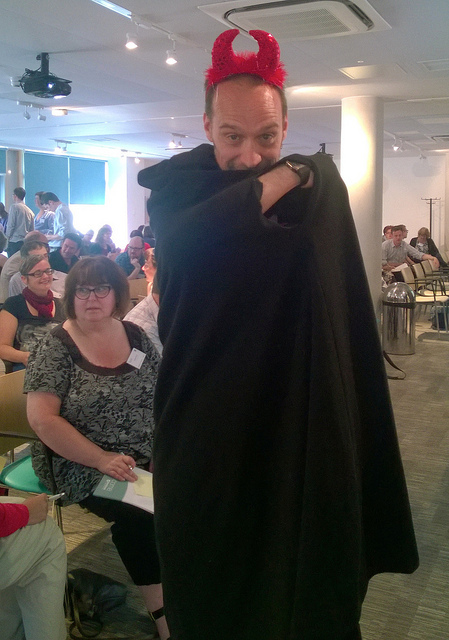 What we added was a little more “skylarking”, (which I’ve recently discovered is a naval term, indeed a naval offence) with Jason donning a pair of devil horns and a cape, to try an offset and negativity caused by thinking of all the ways of systems could fail. The delegates were given post it notes and asked to work in pairs or threes to think of ways to disrupt the student, the post its got stuck on flipcharts, and then the delegates voted for the best (or worst) idea. When we trialled the process on folk they identified specific items that could cause disruption. Our much missed, globe trotting librarian Emma Illiglesworth (@wigglesweets) suggested that any tampering with the “blue chip machine” close to an assessment deadline might cause disaster. The blue chip machine is what students use to top up their print credits. For audit reasons library staff can’t attempt to fix the machine, so any failures mean a maintenance call… which takes time. In the sessions our ISConf14 delegates produced more generic suggestions, and indeed the winning (or more evil) idea as voted at the end of the session was “redirect studentcentral (our VLE) traffic to the One Direction website”. This could have been a result of making people talk to each other, instead of focussing on their areas of expertise. Whatever, the session did stimulate a lot of discussion, and drawing the delegates back to share their findings at the end required amplification. In your day job, helping students to achieve their potential… what would you do if you wanted them to fail? Assuming you want them to succeed what are you doing to prevent that failure? At the #Cetis14 conference the final keynote by Audrey Watters @audreywatters looked at the history of learning technology, and how it is shaped by folk to tell their point of view. It reminded me of a session I ran at the 2012 Jisc Online Conference called “Looking back to shape the future: The History of learning technology in 100 objects…” which managed to riff on both the popular 80’s film AND a (then) popular BBC series. The setup for the session was that sometimes technology changes the way we can work, and the way we can learn. The session aimed to record some of the landmarks in teaching technology by creating a collaborative teaching technology timeline using timeline.js (a fantastic bit of scripting). I tweeted a link to the timeline and several folk seemed interested so I thought it might be useful to share the link to the timeline, and the google form, and a recording of the presentation. We had a number of submissions and in the conference session we discussed what it was that made the difference. You can add to the timeline using this Google form.